We apologize for the long silence... we've been hard at work on The Steamers and haven't found the time to update our Steam page. That being said, our twitter @Shack_Studio is always the best place to check if you want to know whats going on with the game. Up to rencently, squads could only be issued orders from the RTS perspective. Now players can also[/] command their squads directly from the third person view. This allows for much more fluid controls during the heat of battle. Everybody in the land of Esporia now has a face. This sounds a lot easier that it was. We are partucularly happy with the elegance and chic of the ladies of Esporia (male citizen will remain a little..."brutish"). 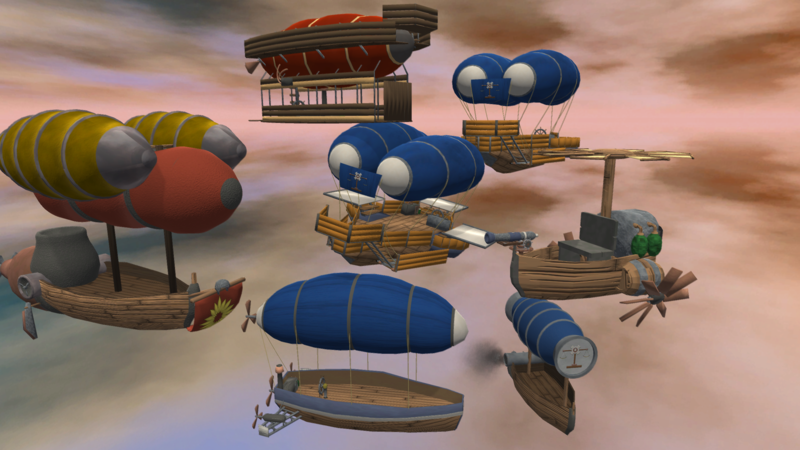 We've added several different and controllable flying machines. Some are light and easily manoeuvrable, others are more cumbersome but able to deploy devastating firepower. We have spent a lot of time making the AI relatively autonomous. This way, players don't have to micro manage their squads and can focus on the more strategically important orders. Squads take cover when in danger and engage any threats. They also know how to leap frog from cover to cover and attack everything they encounter on the way to their destinations. Meanwhile players can remain in the skin of their character and focus on what is the most needed to tip the scales. In addition to all of the "player squad" capabilities, the computer (for lack of a better word), understands the notion of strategic points and will fight for them. The enemy AI knows to protect important locations by reinforcing its positions and capturing surrounding positions. Depending on the mission the AI will know what points the players might prefer and will make it difficult for them to capture and hold them. A new inventory system is being built allowing to pick up weapons on the battelfield and hold on to special quest items. There is plenty more to talk about it but we don't want to overwhelm anybody, so we'll post further announcements soon. We appreciate all the support and feedback that you, the players, have given us. We are happy to answer any questions and consider all feedback. The Steamers is set during the Renaissance Punk era of a steam rich world in a solar system far away. Through a series of very affordable 3 to 4 hours long episodes, players will explore the world of Esporia and live the many events that shaped its history. The game will allow players to command their troops from a bird's eye view in typical real time strategy fashion; while also making it possible for them to jump right into the skin of their character and tip the scale during an enemy encouter. Tactics and planning are of prime importance and commanders will have to learn how to use and support their squads through the use of cover and special abilities. Rushing headfirst and alone into combat will only result in disaster! Strategic locations such as hospitals, villages or heavy weapon emplacements will also provide added strategic depth. Tactically minded players will use them to choke their opponents, access special units or upgrade their defences. Vehicles will be available for commandeering and players can expect to fly in Da Vinci's inspired gliders and Airships, assault castles and forts in steam powered tanks or even ride ostrich as light cavalry support. The Steamers is aiming to be a franchise that never stops to grow, each episode will introduce fresh gameplay elements that will build upon each other and enrich the Esporian world and how the players interact with it. The project is not dead, infact its about to be very alive. We'll be updating our Steam Store page with a release date soon. We apologize for our long silence. We've been extremely busy and absorbed and simply didnt find the time to give you guys a propper update. Captain Flanagan will be in charge of bringing everybody up to date in an upcoming video. Sorry to say, but there will be no VR coming from us in the near future. We're still not satisfied with not being able to physically move more than 3 meters. Above all we just dont have the time to do VR yet. Very very glad to see you guys got Greenlit! Hope to see you guys hit an alpha stage soon enough so we can see this game take shape.